Home / Articles / Vertical farming: sustainable future made in Scotland? In my job I sometimes feel overwhelmed by the challenges connected with how to build a sustainable future. Most of the time the solutions which many well-meaning people bring to my door just don’t add up or they are insufficiently ambitious. More often than not they create a new way of doing things which just moves the problem of a sustainable future elsewhere. They are not solutions. They kick the can along the road. The challenges we have will not be solved by doing a little here and a bit more there. Tinkering with our current systems of old production won’t be enough. For example, one of the biggest challenges we face is how to change the energy balance of agriculture. Currently, we expend about 10 calories of fossil fuel to generate one calorie of food. This is unsustainable not just in a small way but to quite an alarming extent. If we are to tackle this problem farming will need to be completely re-imagined within the next 30 years or so. Such a huge challenge calls for us to take this back to its basics. How can we transfer photons of light from the sun into edible energy at maximum efficiency? This is a really interesting scientific and engineering question but it is also important and answering it might just be the saviour of humanity. We eat the energy which comes from photons, the elementary particles making up light. This happens because photons of light with sufficient energy knock electrons into a higher energy state within the green plant pigment known as chlorophyll. These are then used as the energy needed to manufacture complex molecules like starch, proteins and fats. This is an old story but it has a new and exciting twist. Until a few days ago I thought that “vertical farming” which was the answer which some people had brought to my door as a solution was just another of those ideas designed to kick the can along the road. This was because, after doing some research, I had concluded that it would always be more efficient to use a photon coming directly from the sun to energize electrons in chlorophyll than to use a photon generated by a light powered by electricity. The loss of efficiency involved in generating the electricity, transmitting it to the point of use and then translating the power of electrons into photons would always make this a pretty unattractive option for future food production. But I’m beginning to think I might be wrong. “Vertical farming” is the idea that we can grow plants within enclosed spaces, often including high-rise warehouses, using artificial light instead of the sun. Is it really the future way that our fruit and veg will be produced? I think it could be and here is why. Where once the produce was packed into trucks to be carted around Europe it can be produced next to the point of sale…like in the centre of cities. On a recent visit to a pilot vertical farming unit run by a company called Intelligent Growth Solutions housed at the James Hutton Institute near Dundee I saw what can be achieved by an innovative, never say die, approach. They have worked through the problem of how to translate a photon into edible food. Using the best expertise, much of it in Scottish Universities, they have solved probably the biggest problem in vertical farming. This is concerned with how to improve the efficiency of the Light Emitting Diodes (LEDs) used to generate the photons of light from electricity. They have re-imagined the problem and on the back of their key innovation they are systematically re-engineering the processes of plant production. This draws on the world’s leading technologies in robotics, storage and transport solutions, and plant biology. By intelligently integrating these growing systems with grid electrical generation, including placing them in the right places like in the centre of cities, they can reduce their power costs to a fraction of normal prices. By containing the farms inside buildings they can optimise the atmosphere for plant growth by enhancing CO2 levels and ensuring it is always at the best temperature. Sealed containment eliminates disease (hence no need for pesticides!) and sensors inspect the plants to detect stress so that they can adjust the growing conditions to be just right for the plants. Nitrate and phosphate fertilizers are provided in exactly the quantities need by the plants and there is no waste and, therefore, no environmental impact. Robots will busily move pollen around to fertilise plants like beans or soft fruits. All this will happen in stacked plant trays, each of which is tended carefully, and untiringly, by robots around the clock. The plants will grow perhaps at least twice as fast as they do in the field. There is no need for heavy machinery to plough, sow and harvest. Where once many human hands were needed none are now needed. Where once the plants had to put up with all that the weather and climate would throw at them, now they are to be cosseted and their every need catered for. Where once the produce was packed into trucks to be carted around Europe it can be produced next to the point of sale. Where once vast tracts of land were needed, the land footprint is very small. Where once only a single crop was possible each year on that vast area of land now perhaps four or five crops of equivalent size will be produced on the much smaller area. Where once we were oxidising valued soils such as the fenland peatlands of East Anglia to produce vegetables (and a lot of CO2 to boot) these can be returned to the function of storing carbon and hosting wildlife. Where once we produced a lot of food which was wasted we can almost completely eliminate this waste. Will Scotland realise its innovative potential? All this is made possible by one, quite simple, but very clever innovation in how a 3-phase electrical supply can be adapted to feed power to LEDs. This innovation alone is very likely to pop up in other places too. For example, it could completely revolutionise how electricity is routed around factories and even our homes. There is something quite poetic about a bunch of people who are brought together by an entrepreneur with an imaginative idea about farming which could turn out to change all our lives in positive and unimagined ways. This is how innovation works and it’s quite magical. This doesn’t seem to me to be like kicking the can along the road. But one thing worries me. This is happening now in Scotland, driven mainly by the brilliant minds of people mostly in Scottish universities and institutions, as well as a Scottish entrepreneur. However, will Scotland be the country to scale this up and make it real? Will Scotland be the place that the world turns to as the great innovator in vertical farming, like Finland has been for mobile phone technology? This will only happen if the major capital investments needed to turn this into an industrial reality are made in Scotland. Otherwise perhaps we’ve just kicked the photon along the road, but at least we’ll have the great satisfaction of knowing we’ve just done something really great towards saving the planet. 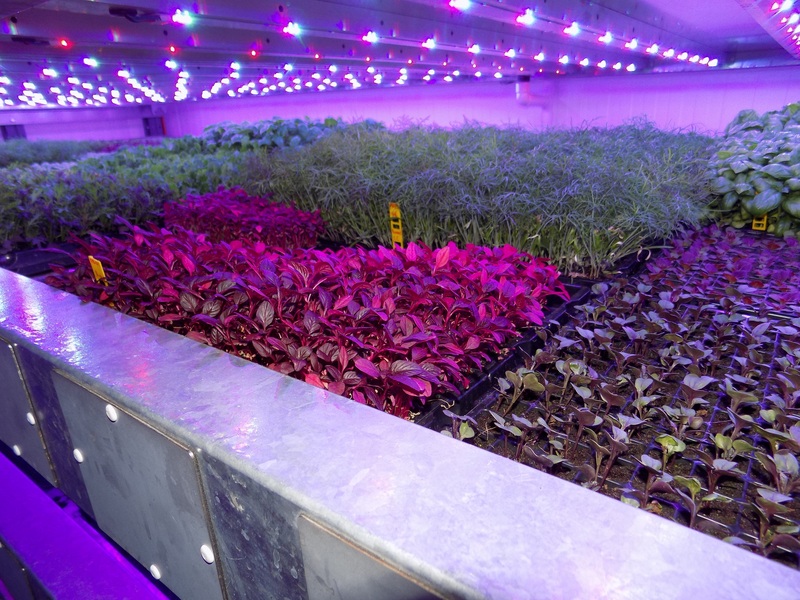 Featured image courtesy of Intelligent Growth Solutions shows plants growing at the pilot vertical farming unit near Dundee. Professor Ian Boyd is currently Professor in Biology at the University of St Andrews. He is also Chief Scientific Adviser at the Department of Environment, Food and Rural Affairs (Defra).